This fairly ambient collection was improvised in one session around Feb 2001 in my basement flat in Kemptown, Brighton, using a non-released version of Gbloink! (in development between versions 1.5 and 1.8). The soundcard was a SoundBlaster Live, which is why this has great sounds. At the end of 2000 I had received a wind-up radio for christmas. Its inventor Trevor Baylis, was famously a resident of Eel Pie Island itself - a small island in the Thames, often connected with various 60s and 70s music scenes. The island's name was probably far more of an inspiration than the music normally associated with it. I was reading Haruki Murakami's "Wind-up Bird" Chronicle with it's strange, tragic, dreamy atmosphere. And haunting image of a guy who chooses to spend time sitting alone at the bottom of a well. And Kamakaze submarines and Boris, the Manskinner. 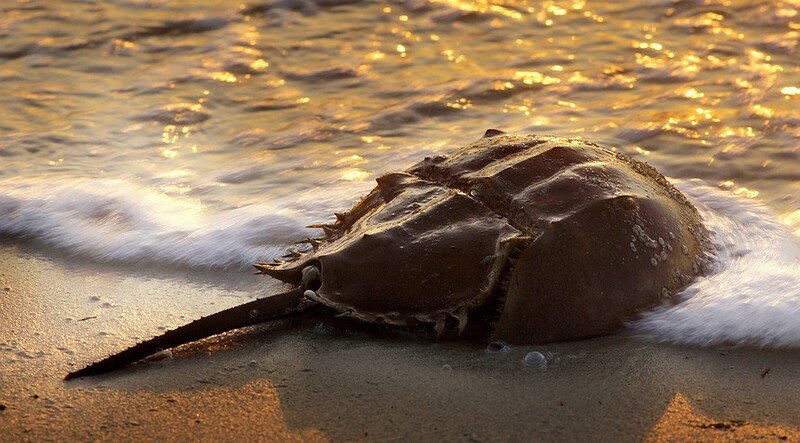 And there was something about a photo of Horseshoe Crabs in Chesapeake Bay. Weird and a prehistoric. In contrast to The Great Grimpon Mire with its intense green gloopiness. Eel Pie Island is all desolate mudflats at sunset; long, picturesque stretches of melancholy with ocassional flocks of rattling and scuttering percussion - interjected by phases of very LOUD and violent, mechanical clanking. In one sense this was a pretty lazy and minimal piece to produce. Each track is typically a single mood elongated to 8 to 10 minutes. However, it's grown on me a lot over the years. Now it's one of the Gbloink! recordings from that time that I pull out most often to listen to. Especially the easier tracks 2, 3 and 5.